Voice Message fallback happens when a call is made to unvailable (offline, DND, Busy, Out of coverage) single users or when a call is made to a group where none of the recipients are available. 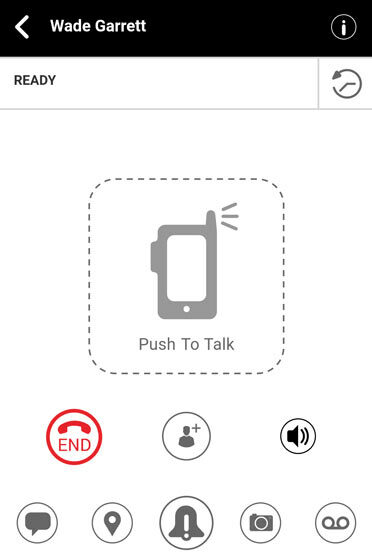 During fallback the on-screen display shifts from the PTT icon to the Voice message icon and a unique chirping tone is played. From the Ready screen, tap the Voice messsage icon . Alternatively, tap the History icon then tap theVoice messsage icon . Touch and hold the Voice messsage icon to record your voice message. Your voice message recording must be longer than 3 seconds to send. Release the Voice messsage icon to stop recording then tap the Save icon to send. Alternatively, tap the Play icon to reivew the message or the Delete icon to discard your recording. The Voice Message attachement will be delivered when recipient becomes available.